Learn all about dastardly pirates in this children’s book full of photographs and illustrations, fascinating facts, and engaging challenges—from the creators of DKfindout.com, DK’s free online resource for kids. Did you know that Blackbeard’s crew had more than 400 pirates in it? Or that pirates were more likely to steal sugar and spices than gold and jewels? Find out why! Perfect for curious readers who want a highly visual history book to increase their pirate knowledge, DK findout! Pirates is sure to inspire. Inside, author E. T. Fox breaks down what pirates are, how they live, and why we are so fascinated with them. The DK findout! series of kids books helps children become experts on their favorite nonfiction subjects, from dinosaurs and ancient civilizations to space, coding, and cutting-edge technology. 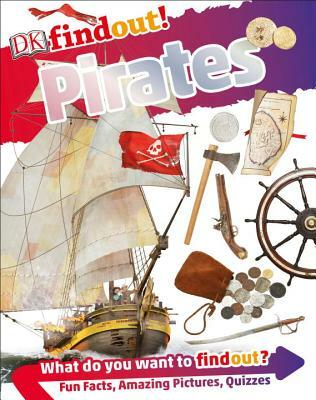 Learn more about pirates—and everything else—at www.dkfindout.com, the award-winning free educational website. Ed Fox is an historian and author, specialising in British and Atlantic maritime history, with particular expertise in piracy and maritime crime, colonial history, privateering, and technological history, of the sixteenth-nineteenth centuries. Ed received his M.A. in maritime history from the University of Exeter. As well as having published books and articles, Ed has contributed as an advisor and “talking head” to numerous television productions, regularly lectures on various topics, and is the curator of the Golden Hind museum ship in Brixham, Devon.